Create Stunning Black & Whites in No Time! Processing black and white photos is a skill of its own. Learn how it's done – in less than 2 hours! As a photographer, you know it’s super-important to have solid editing skills. The exact same shot can could be inspiring or be totally overlooked, all depending on the adjustments you make. 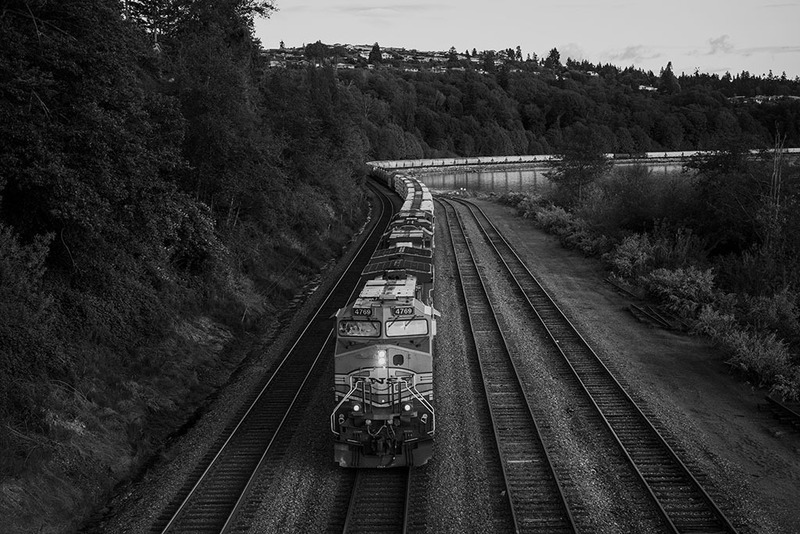 …As you sort through your photos, you find a shot that you think would look incredible in black and white. Black and white processing can put the focus on a powerful expression or standout composition in a way that color just can’t. So you try out the default black and white conversion, but the results are super-bland. You make your usual adjustments but, inexplicably, your would-be-amazing photo still falls totally flat. What gives? Editing in black and white requires a different approach from editing in color. When you take color out of the equation, you change the dynamics of the shot. That bright green bicycle – it’s now the exact same shade of grey as the wall behind it. You’re going to have to find new ways to make it pop. Here’s the good news: Learning how to make your black and whites stand out – it doesn’t have to be hard. I’m going to show you, step-by-step, how to use Lightroom to produce stunning black and whites that’ll take you only minutes to create! Check out this video to meet Rob, the author of this tutorial, and learn more about how Before/After: Black & White can help you get creative and dramatic black and whites with Lightroom. 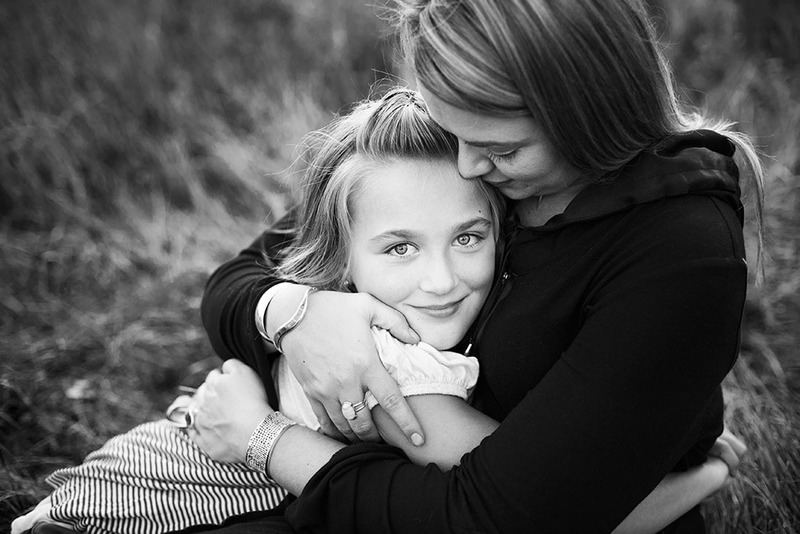 Learn to give your portrait shots the crisp, classic black and white finish that photographers want and clients love. Get the skills you need to take a lifeless, overexposed shot and transform it into a stunning black and white that’s truly epic! 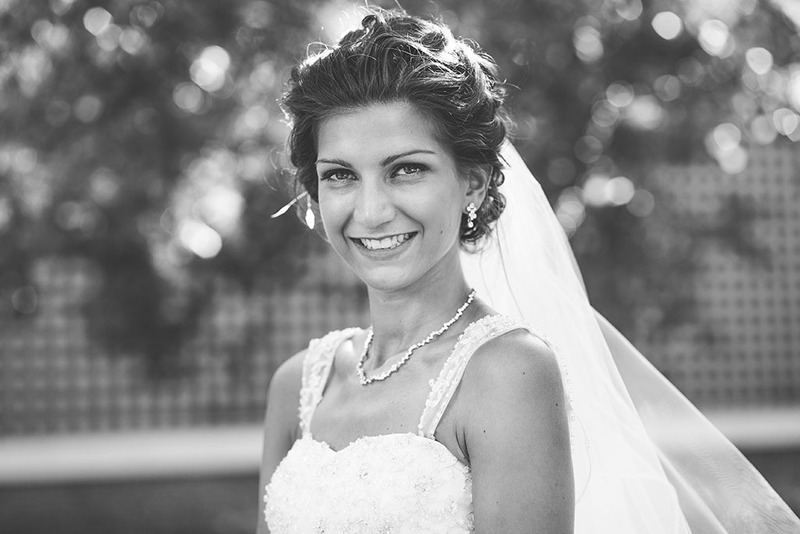 A subtle touch of sepia – that pretty golden-yellow tone we associate with old photos – can add elegance to your images. But when you rely on presets to add tones to your shots, you don’t have much control over the effect. I’ll show you a couple simple ways to create this effect yourself, so that you can choose exactly what colors you want to use, and how far you want to take them. Finally, it’s going to be easy for you to get the exact look you want! When you’re editing in black and white, you need a different approach from when you’re editing in color. I’ll show you exactly what tools to use, and how to use them, to make sure your black and whites really grab your viewer’s attention. Just because you’re shooting digital doesn’t mean you have to give up that grainy film aesthetic. I’ll show you the simple way to get that old-school look. I’ll also show you how to get that popular, washed-out look without losing punch or oomph. You’ll be able to create photos that are dreamily faded, but still effective at grabbing your viewer’s attention and directing it where you want it to go. Dodging and burning can make the difference between a shot your viewer glances over, and one that stays with them. Learn these essential skills, and pick up tips that make them even easier to apply to your photos. Textured backgrounds, like leafy trees, can seriously distract from your subject. I’ll show simple techniques to selectively brighten and darken background colors, and tell you when to use them, to really help your subjects pop! Night scenes can make for bold black and whites. But it’s easy to loose too much detail to the darkness. 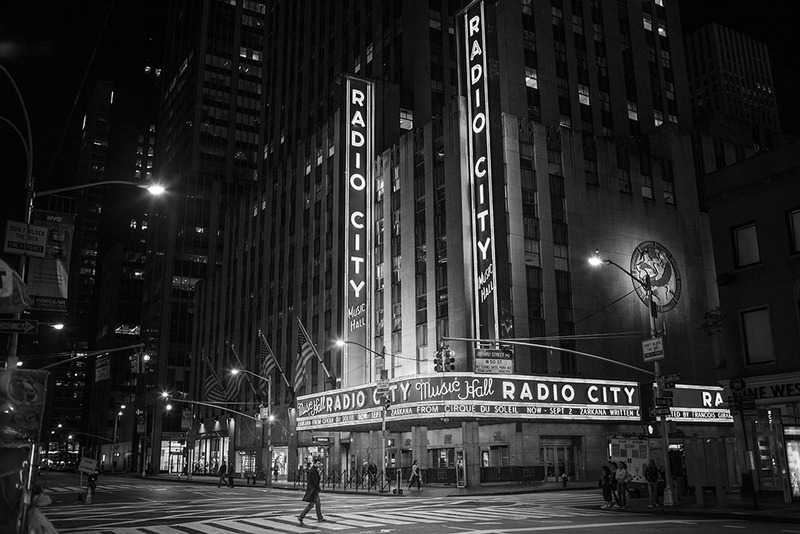 Learn how to subtly brighten night scenes to keep the detail and get the drama. 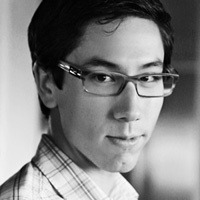 When you know what tools to use, it’s easy to take a black and white from totally bland to timelessly polished. Follow along as I process 10 images, start to finish, transforming them from Lightroom’s dull default black and white setting into shots with drama, style and emotion. You’ll find out exactly which tools to use and how to use them to create those classic black and whites that photographers envy and clients love. PLUS, I’m going to show you how to get creative with your black and whites, because when it comes to editing, one size doesn’t fit all. I want you to have the skills you need to edit images in your own style, so that you can convey your vision. With this tutorial, you’ll learn the techniques to recreate a variety of styles (classic, film, sepia, and that popular washed-out look) – and gain the know-how to adapt them and create black and white looks that are all your own. In under 2 hours, you could be producing incredible black and whites that suit your style and grab your viewer’s attention the way you know they should. How to convert your images to black and white, instantly. Three powerful tools you can use to bring more attention to your subject. How to dodge and burn to create drama and produce more memorable images. How to make your images pop using the basics panel. How to use the tone curve to fine-tune contrast and perfect the look of your shots. Two easy ways to add colored tints to your black and whites (like classic sepia!). Tips for creating eye-catching black and white portraits. Recover missing tonal information for a more polished look. A simple way to make your digital photos look like textured, old-fashioned film. How to get that popular, washed-out look without making your images look bland. How to fix uneven lines and lens vignetting in one click! Basic retouching, like removing distractions and brightening dark circles. The essential Lightroom shortcuts you need to save tons of editing time! And best of all, you’ll get to learn it all visually, by watching along in videos as each change is made. This is by far the best and fastest way to learn post-processing. You can see it all happening right before your eyes and quickly understand how each tool enhances the photo. 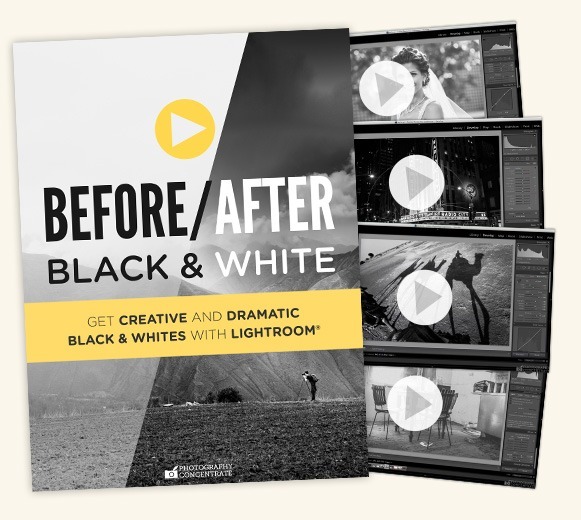 Before/After: Black & White is in a digital download format, so you can start learning right away. The tutorial comes as a .zip file with 10 HD .mp4 videos that work on both Macs and PCs. Download them and they’re yours to keep forever! They’ll always be there for a quick refresher, or to play while you do your own processing. To help you see what this tutorial is all about, I’m giving you one complete Before/After: Black & White video, totally FREE! Watch how I process a photo in black and white, start to finish, and boost your editing. With the tutorial, you’ll get 9 more of these and pick up so many more tips that’ll make your black and whites stand out! Instead, Before/After: Black & White is going to get straight to the fun stuff! In less than 2 hours, you’ll have the know-how to create beautiful black and white images in just minutes! 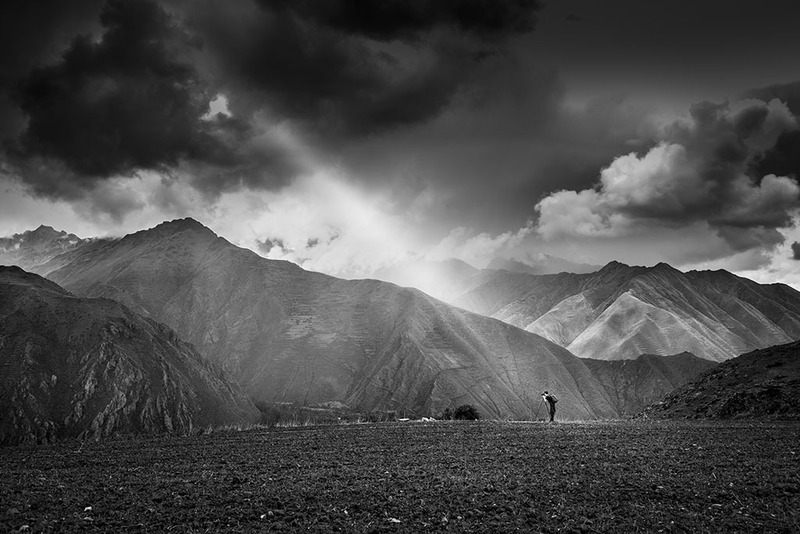 You're totally new to creating black and white images in Lightroom. You know a bit about creating black and whites, but aren't sure if you're using the best tools for the job. You're looking for ways to give your black and whites more punch and polish. You want to get more creative when you're editing your black and whites. You know a bit about Lightroom, but want a quick refresher on what the basic editing tools are and how they work. Here’s the best part: this tutorial is going to make it so simple and enjoyable for you to learn. If you want to really understand how to use Lightroom’s tools to make great edits, you need to be able to see what they do. And with Before/After: Black & White, you’ll get just that. I’ll take you through my process, showing you what tools to use and how to use them in order to produce everything from classic black and whites, to shots with more unique black and white effects. Try Before/After: Black & White for a full 60 Days, and if you don't feel like you have stronger black and white processing skills, you'll get 100% of your money back. Just email me directly at [email protected] and I will refund your money personally. No questions asked. You’re going to love this tutorial – I’m that confident. Get the entire tutorial for only US$67, and be on your way to better images for life! ...And transform the look of your images! 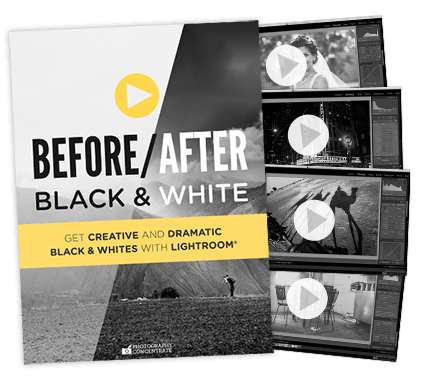 GET STARTED NOW AND GAIN POWERFUL BLACK & WHITE PROCESSING SKILLS TODAY! When you have the skills to create great black and whites, you open up a whole new world of creative possibility for your images. And that’s going to translate into greater satisfaction and success with your art. Think about it. In less than two hours, you’ll have the skills you need to process powerful black and whites that share your message with the world, in your style. Once you see what’s possible, and how easy it is to achieve, you’ll be itching to get started, today. This could just be that burst of inspiration you need to take you to the next level! I’m so excited to see what you’re going to create with this tutorial. Are you ready to start transforming your photos into amazing black and whites? Grab your copy now and let’s go! P.S. Remember, I made this a no-brainer for you. You get a full 60 Days to try Before/After: Black & White so there is zero risk for you. If you aren’t totally and completely satisfied, get 100% of your money back. No questions asked. Get it now and transform your images!